Provide comfort for the family of Mary Ristuccia with a meaningful gesture of sympathy. Of Belmont & West Dennis, died peacefully Wednesday January 16th, 2019 at the Mount Auburn Hospital in Cambridge at the age of 96. Born on October 31, 1922 in Belmont; daughter of the late Natale and Caterina (Panto) Lania, Mary was a lifelong resident of Belmont. She summered for many years with her family in West Dennis on Cape Cod. A graduate of Belmont High School, she worked at Berman Levine Dress Company, in research at M.I.T. Lincoln Laboratories and retired from the Belmont Housing Authority. Mary was a devout Catholic and communicant of Saint Luke’s Parish community in Belmont and Saint Pius X Church in South Yarmouth. Mary and her late husband were instrumental in Belmont High School Parents of Music Students (POMS) association and helped with the fund raising efforts for the Belmont Senior Center and Saint Pius the X school. Family was most important to Mary and in her spare time she enjoyed reading, cooking, Catholic TV, playing cards and bingo; but, most especially she loved spending time with family and friends at her Belmont and West Dennis home. Every Tuesday, Saturday and Sunday were family gatherings at her home where she loved hosting and being surrounded by her family. Beloved wife for 65 years to Lawrence A. "Larry" Ristuccia, Mary is survived by her devoted and loving children Paul L. Ristuccia and his wife Ya-Ling of Newcastle, Washington and Marie Ellen (Ristuccia) Sparks and her husband David of Westford, her cherished granddaughters Erica Sparks and Nicole Gagnon and her husband Travis, her adoring great grandson Jamison, and her dearest sister and best friend Josephine Bucciarelli. In addition she is survived by many nieces & nephews including, Kathy Grossi, Robert Lania, Judy Ascensao and James Bucciarelli, as well as Anne D'Aveni, Joseph Lania and Donald Lania. Sister of the late Lena Bernstein, Anthony, Philip, Joseph, Margaret and Salvatore Lania, and Antoinette Donoghue. 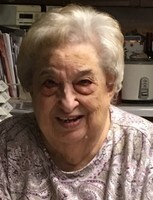 Relatives and Friends are respectfully invited to attend Funeral Services from the Brasco & Sons Memorial Chapels, 325 Trapelo Road, BELMONT on Saturday Jan. 19th at 8:00 a.m. with a Mass of Christian Burial in celebration of Mary’s Life at Saint Luke’s Church, 132 Lexington Street, Belmont at 9:00 a.m. Interment will follow at Calvary Cemetery in Waltham. Visiting Hours will be held in the Funeral Home on Friday Jan. 18th from 3 – 7 p.m. Parking attendants will be on duty. To send flowers in memory of Mary S. Ristuccia (Lania), please visit our Heartfelt Sympathies Store.